Hobson, Rev. & Mrs. O. O. The conference of the United Evangelical church in Des Moines last week sent the Adaville church a new minister, Rev. O. O. Hobson. Rev. S. M. Zike, who has served the church for several years, was sent to a new charge. Rev. Zike goes to a good appointment at Dumont. The change was a surprise to his congregation. The conference of the United Brethren Church in Albia, Iowa, last week, returned Rev. O. O. Hobson to the pastorate of the church at Adaville and named Rev. L. A. Fleming as pastor of the Kingsley church of that denomination. The conference of the United Brethren Church, in session at Cedar Rapids the past week, made a change in the pastor of Adaville church, the only church of that denomination in this county. Rev. 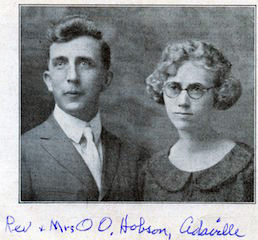 O. O. Hobson, who has served the church for several years, was transferred to Moravia in the south part of the state, and is succeeded at Adaville by Rev. L. A. Fleming. Other appointments in which people of Adaville vicinity will be interested are Rev. G. H. Varce to Ventura and Rev. S. M. Zike to Dumont.